Interesting review and I enjoyed reading your thoughts on the subject of Viragos. I've only read one Spark so far ('Loitering with Intent') which I had mixed feelings about but I certainly could not deny that it was cleverly written. I think I have grown to look more fondly upon it since reading it. 'Symposium' sounds intriguing and I might make it my next Spark (along with the very well-known 'Jean Brodie'). intriguing review - I keep meaning to read more Spark. Thank you for taking part this week and for posting such wonderful posts - it's been a pleasure to have you! Like Rachel, I'm woefully aware of just how little Sparks I've read. This novel sounds like the first act of Caryl Churchill's play 'Top Girls', also set round a dinner table. Do you know it? Ooo, you've really whetted my appetite with this review... I have a small pile of Spark novels now (how nice to 'discover' an author who is available cheaply!) but not Symposium, I don't think. I love that she writes powerful SHORT novels - my favourite! Rochester Reader - it's been good catching up with your blog over the last few days. I find Spark quite a fascinating writer in much the same way that a rabbit is fascinated by a stoat. 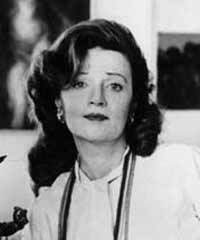 I enjoy her writing but my god, can you imagine how terrifying it would have been to meet her? Rachel - it's been great fun, and I hope something you do again. I've found lots of new books for my wish list. There's a darkness in Spark that can be very refreshing, that's how I feel about it, but which I imagine could be quite repulsive as well. I hope you enjoy! Annie - Like Simon says her books are wonderfully short which makes her absolutly the writer to take a chance on... I don't know Top Girls but will keep an eye out for it. Simon powerful SHORT novels are my favourite as well. 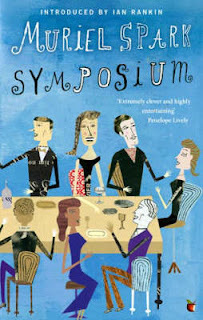 Symposium is a good one murder, mayhem, mystery, madness - all the m's.